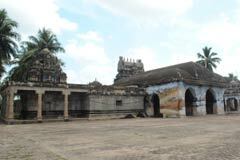 The temple is praised by Saint Tirunavukkarasar in Thevaram hymns. 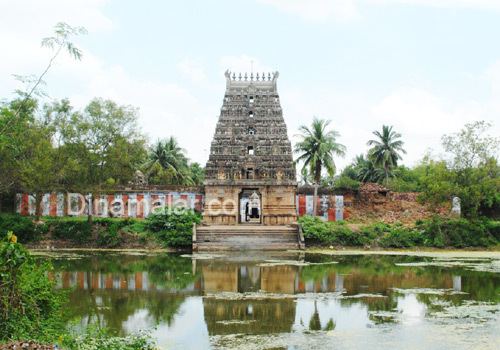 This is the 26th Shiva temple on the northern bank of Cauvery praised in Thevaram hymns. Masi Magam in February-March; 10 day Kamadagana utsav and Brahmmostsavam are the important festivals of the temple with Pancha Murthy procession. Margazhi Tiruvadhirai in December-January with Lord’s procession is the other great festival. Monthly pradosha days occurring on the 13th of new moon and full moon fortnights; Navarathri in September-October, Deepavali in October-November; Pongal or Makara Sankranti falling almost on January 14 in each year; Tamil and English New Year Days are also observed devotionally in the temple. There is a lotus flower design in the Avudayar-the seat or peeta on which the Linga is placed. 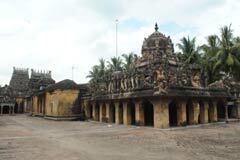 This is one of the eight places (Atta Veeratta Sthalas) where Lord Shiva played heroic events. He burnt the cupid (Manmatha) in this place. Rathi and Manmatha are in the temple as procession deities. 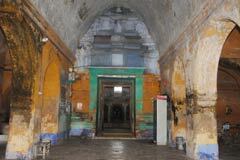 The place has the reputation of Sage Theerthavagu bringing Holy Ganga for the consecration of the temple. The temple is open from 7.00 a.m. and 12.00 a.m. and from 3.30 p.m. to 9.00 p.m.
Sri Veeratteswarar Temple, Korukkai, Nagapattinam district. 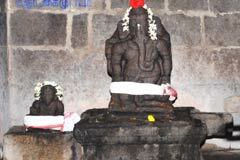 Sri Vinayaka of the temple is praised as Lord Kurungai Ganapathi. Of the eight places known as Atta Veera Sthalas of Lord Shiva, this is the place where cupid-Manmatha was burnt, hence Lord is praised as Kama Dahana Murthy. He appears in a sitting posture with His left leg folded, right hanging down, right hand assuring His devotees – with Abhaya Mudra – and the left hand on the left leg. 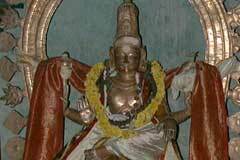 It is worthy to note the places linked with the history of this temple in Kurukkai. 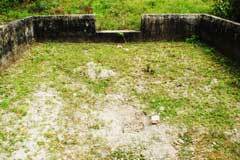 This is the place where Manmatha attempted to disturb the penance of Lord. 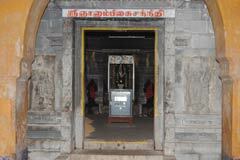 Kanganam Puthur is the place where he decided to disturb the penance of Lord Shiva and tied the vow thread in his hand. He drank the milk at Palakudi. Took his bow at Villinur. Aimed at the Lord at Kavalamedu. Those who followed him at Ivanallur suggested action from here. As the place was not suitable, Manmatha came to Mettu Korkai and tried directions. Finally, he applied the arrow on Lord from a corner. Devotees pray to Kama Dahana Murthy for physical and mental health, for steadfastness of mind, removal of hardships and mental peace. They also pray for job, promotions, wedding and child boons. Those seeking wedding boon offer Kalyana Malai to Lord. 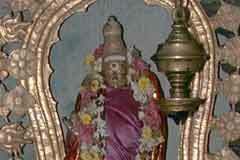 Devotees perform special sandal abhishek to Mother Ambica and offer vastras to both. They also perform abishek with turmeric powder, cosmetic powder and oils, milk, honey, curd, green coconut, panchamirtha and lime fruit juice. Some undertake Annadhana-feeding visitors and public. They also contribute for the renovation of the temple. Puthrakameshti Yaga is performed in the temple by those seeking child boon. Lord is praised as Yogeswara. Mother Goddess is Gnambikai. As Lord is in meditation for ever, it is difficult to have his darshan. It is not possible to have the darshan when one desires it. Some obstacle would intervene. A devotee, lucky enough to have darshan when he plans, would be blessed with the power of penance, it is believed. Lord forgives anyone praying to him for sins committed unintentionally and unknowingly. 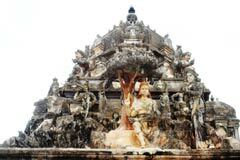 The Vimana above Lord Kurungai Ganapathi is of Gajapushta design. People seek remedies for effects of past births, seek child boon and celebrate their 70th birthdays in the temple. Those surrendering at the feet of Lord Yogeswara get back their lost properties. They are freed from lust and enmity qualities. Cupid-Manmatha, the deity of love and lust was burnt here and had a rebirth in this place. Lord Shiva was under deep meditation. The heat that emanated from the penance had its impact everywhere. The Devas, unable to bear the heat, approached Lord Muruga to stop Lord’s meditation and save them. But Muruga refused to disturb His Father’s penance. They finally approached Manmatha. Without thinking of the consequences, foolish Manmatha applied his love arrows on Lord to disturb the penance. Lord opened His eyes and burnt him with the fire sparks from His third eye in His forehead. Rathi his wife fell at Lord’s feet and begged for her husband’s life. Lord assured her that he would be sent to Devaloka for her on a new moon fortnight. Thus Manmatha had his rebirth here. Tirukorukkai is 3 km on Mayiladuthurai-Kondal route. Bus facilities are not convenient. Cabs can be hired to reach the temple. Rapheals: +91-04364-227 291 and 292.